The University of Granada, founded in 1531, is one of the largest and most important universities in Spain. It serves more than 60000 students per year, including many foreign students, as UGR is the leader host institution in the Erasmus program. UGR is a leading institution in research, located in the top 5/10 of Spanish universities by a variety of ranking criteria, such as national R&D projects, fellowships awarded, publications, or international funding. The UGR stands out especially in production levels in areas such as Computer Science-Artificial Intelligence; Information Science & Library Science; Multidisciplinary, Particles & Fields; Astronomy and Astrophysics; Nutrition & Dietetics; Engineering - Electrical & Electronic and Education & Educational Research and Psychology. The +4,300 researchers of UGR are grouped into 521 research groups covering all scientific fields and disciplines from the Humanities, Social and Legal Sciences, Engineering, Healthcare, Information Technology and Communications and all areas of science. UGR has been very active in the area of EC projects, in FP7 and H2020. In addition, UGR is involved in a wide range of international networks and leverages on co-operation with partners throughout the world. José María Martín Civantos – male - Associate Professor at Universidad de Granada. Department of Medieval History and Historiographic Techniques. Expertise areas: Islamic Archaeology, Landscape and Hydraulic Archaeology. Researcher in 27 projects and 19 research contracts in Spain, Italy, Morocco and Albania. Principal Investigator in 11 projects and 14 research contracts. Awarded by the European Commission with a FP-7 research grant to coordinate MEMOLA project: An historical Approach to Cultural Heritage based on Traditional Agrosystems (http://memolaproject.eu/). Lara Delgado Anés – female - Archaeologist with a PhD in History by the University of Granada (2017); MS in Physical and Forensic Anthropologist (2012); MA in Knowledge and protection of the historical heritage (2011). 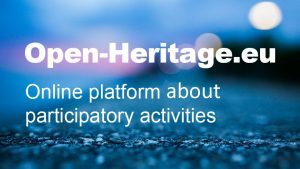 Specialised in community archaeology, management and communication in cultural heritage and participatory social activities. Experience organising and executing educational activities, as well as elaborating educational resources and audiovisual products. Outreach coordinator of the of the recently concluded FP7 MEMOLA project (2014-2017) (http://memolaproject.eu/). Maurizio Toscano – male - Archaeologist, digital humanist specialised in the use of computing and digital technologies in the humanities, especially history, archaeology, history of arts and cultural Heritage. He developed more than 10 online platforms for research and heritage projects in Spain, Ireland and Italy. He has been the technology manager and Web developer of the recently concluded FP7 MEMOLA project (2014-2017) (http://memolaproject.eu/). His expertise areas are: database structuring, Web development, Geographical Information Systems and spatial analysis, data visualisation and analysis, national and european project writing and managing.